Imbolc is a special time of year, especially for those of us who are getting some lucky springish weather appropriate to the season. Imbolc means in the belly and is the time of year when the ewes are either pregnant or lactating, promising the renewal of life to the earth. You begin to see early spring flowers like snowdrops and hyacinths, and maybe even some animals poking about if there is a break in the weather. This is the time of year when the goddess is in wait. She has spent a long, lonely winter without companionship and now she is on the prowl for a lover and mate. She may sample many before consenting to become a wife, but she dresses as a bride to show her prospective marriageability. She is still young and wild and free and she is dressed in white, yellow and green to reflect the seasons colors. In Irish mythos however, it is still the time of the hag Cailleach, who chooses the weather this time of year. If Imbolc dawns sunny and bright, be happy for the relief, because it means she is gathering firewood for the winter, which will be lasting much longer. I guess that’s bad luck on me because it’s positively beautiful outside right now! I’ll be spending my Imbolc in school tonight but on Friday some friends and I are going hiking in a local nature preserve. 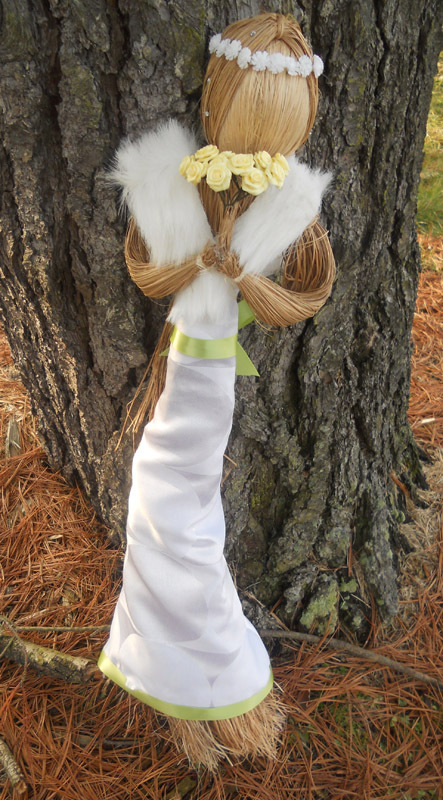 We will bring the Bride doll I just made with us as well as candles and offerings (bird seed and such) and spend some contented hours in the woods praising the Bride. So dance with me until he pays you heed. The Bride Doll will soon be for sale at The Red Lass Emporium for $25. Each doll is made only after it has been ordered and therefor you should expect some variance in the apperance due to material availability. We are getting some lovely signs of the beginning of Spring here in Ohio. (At least where I am.) It’s cool outside but the sun is shining and the grass is green. It makes me start thinking about looking for what I’d like to do in my garden this year. I’ve decided to start experimenting with some of the poisonous plants in my area and gathering them to my door. Like a fool last year I was mowing and I cut down a nice bunch of Henbane without a second thought. Mainly because I didn’t know what it was. This year when I see it coming up, I’ll leave a sacrifice, pull it up and replant it closer to the house so it stays safe. Also when walking in the park and around Yellow Springs I’ve seen Bittersweet Nightshade growing in shady places. I’ll have to transport some of that too. In previous years my garden has been largely the veggie variety and I’ve had decent luck with it so far. I also need to grow some sage and perhaps try and cultivate some blackberries. I’ve always wanted a nice bush in the thicket out back. It’s also getting temperate enough that I might be able to search for hag stones to add to The Red Lass. I’ve been debating making charms and necklaces with them for a while now but the rivers around here have been freezing cold and snowy. I did a poll on my FB page and people have indicated that they want to see more jewelry and talismans so I need to get to work on that. Also I am about to put in an order for the herbs and packaging I need. My on-line half of the business isn’t too productive (not 1 order since it opened). However the vending portion is making it quite nicely and with Spring Fling and Farmer’s Markets not too far away I need a good supply built up. I’m still largely staying away from witchcraft related items in my shop. Number 1: I think we all know the Witch of the Forest Grove has that well covered, and Number 2: This is Ohio. I don’t even tell most people about my practice because of the reactions I’ve gotten before. Imbolc is fast approaching and I’ve considered making candles both for myself and to sell in the shop. I also want to make a few Brigid’s Cross for the house.